Chronic absence is a problem we can solve. And we must because it is a barrier preventing millions of children and youth from benefitting from an education that prepares them for success in school, work and life. When we launched the Attendance Awareness Campaign, chronic absence was an alarming, largely overlooked problem. Today the federal Every Student Succeeds Act (ESSA) requires all states to report on chronic absence. The vast majority (36 states plus the District of Columbia) adopted a chronic absence metric in their state plans. Now we can all see how many students are missing out on the opportunity to learn. The most recent national data collected for the 2015-16 school year finds that 8 million students (1 out of 7) are chronically absent. Chronic absence is typically defined as missing 10 percent of the school year – or just two days a month – for any reason. This is not just a problem in middle and high school: It starts in kindergarten and preschool. It is a problem in districts of every size, whether they are urban, suburban or rural. While chronic absence is widespread, it is also highly concentrated. Our 2016 report, Preventing Missed Opportunity, found that nine out of 10 U.S. school districts experience some level of chronic absenteeism. We also found that half of the nation’s chronically absent students are concentrated in just 4 percent of its districts. Our 2018 report, Data Matters, discovered that just over half (nearly 52 percent) of all chronically absent students are concentrated in schools experiencing high or extreme levels of chronic absenteeism among their students. The good news is chronic absence is a problem we can fix when schools and communities collaborate with students and families, starting in the early grades, to identify and overcome barriers to getting to school. Together we can nurture a culture of engagement and attendance that encourages showing up every day even when it isn’t easy. This starts by helping everyone in the community recognize they have a stake and a role. It requires careful attention to data and strategic, locally tailored interventions to address attendance challenges as soon as chronic absence emerges as a problem. This PBS NewsHour video, “Empty Chairs ” illustrates what is possible. It showcases how the Cleveland Metropolitan School District is making a difference through its positive, problem-solving approach that engages families and students and draws upon the assets of the entire community. 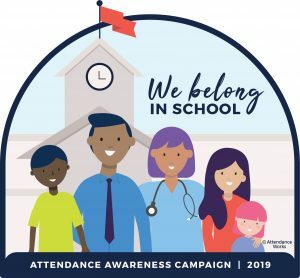 We’re using this seventh annual Attendance Awareness Campaign to encourage everyone to remember that students are more likely to attend school if they feel emotionally and physically safe, connected and supported, and believe they can learn and achieve. Read our Key Messages to learn more. Under this year’s theme, We Belong in School! we are emphasizing the role everyone, from educators to health professionals, to local agency and business partners can play in creating welcoming and engaging schools that encourage daily attendance. They should also connect students and families to needed resources to overcome barriers to getting to school. It’s essential to use data to determine who, when and where students are most likely to miss too much school. This information can then be used to activate supports to prevent students from missing so much school they fall academically behind. While local action is always essential, this year we again are also highlighting how states can play a leadership role in encouraging districts, schools and community partners to work together to improve student attendance. State leaders can leverage implementation of ESSA to make available timely data, support professional development, and allocate public and community resources to address chronic absence. Since 2013, Attendance Awareness Campaign has engaged thousands of schools and communities. Over 75 national and state organizations are now working together to ensure everyone can participate, from a single school to a citywide coalition to a national or state organization. Sign up here to receive regular updates and tips for improving attendance. Browse the links below and click on what interests you. A special thank you to our Attendance Awareness Campaign corporate sponsors for their commitment to help ensure that every child is in school every day. Their generous investment makes it possible for us to provide you with free strategies and materials. Thank you Safe and Civil Schools, French Toast, and In Class Today!